I want to express my thanks to Williams Stained Glass for the exquisite work they did restoring my antique lamp. The craftsmanship and attention to detail that went into the work that was done is remarkable. I highly recommend them. My husband and I absolutely love our stained glass window! It is gorgeous and Mike did a wonderful job installing it. He even removed trim and painted to make sure it looked perfect! Thank you all for your beautiful craftsmanship, quick lead time, and great customer service. 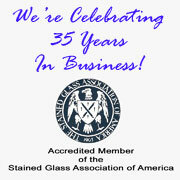 We will definitely recommend Williams Stained Glass Studio! We are extremely happy with the window, and the installation was perfect too. We couldn’t be happier. You all were wonderful to work with every step of the way. Thank you so much. Decorative stained glass panels can be installed in several ways. I have received so many complements. Your help in drawing, choosing colors, and installing are first-rate. Keep up the good work. The windows are spectacular and we are priviledged to have your work in our house. Every one admired the lovely addition to Faith Lutheran Church, the beauty of the medallions and how well the colors blend. Many said it brought tears to their eyes. Thank you for our beautiful window. It far surpasses any of my expectations. Every aspect of your operation from the showroom, design, fabrication to final installation is first rate. It is still nice to know that there are still artisans who place quality above quantity. The dramatic results are clear proof of an artistic talent which we cannot praise highly enough. Working with Williams Stained Glass studio was a pleasant, fun experience. We have nothing but the highest regard for Williams Stained Glass, your work ethic, and competence.